We’ve all heard some variation of the following said by healthy adults: “If I get sick and need a feeding tube or breathing tube, just let me die. What kind of life is it with a tube to eat or breathe?” While all people are entitled to an opinion, I think it is a common misperception that tubes, lines, and other attachments reduce quality of life. Most parents of children with these devices would say the exact opposite, that medical technology has improved quality of life. I think the main opposition to medical technology is that it creates dependency on a non-human piece of technology. When one can no longer eat, breathe, pee, or poop, suddenly it seems as if you have no control over yourself. The opposition to medical technology is less about the technology itself, and more about the vital faculty it is replacing. In other words, we tend to mourn the loss of a function, such is losing the ability to eat or breathe without assistance. Individuals tend to have more negative feelings toward their underlying condition or disease than toward the medical technology assisting them. The general thought among some individuals with little experience with medical technology is that it is better to be dead than to lose bodily functions like these, thereby requiring a tube or line to provide support. What most people don’t realize is that these medical devices may not improve things to the point of replacing the bodily function, but they may dramatically improve daily life, energy, and health, while reducing pain, fatigue, and other negative symptoms. There is also a spectrum of acceptance of various forms of medical technology. While more invasive, most people do not have a problem with an IV line, because it is usually thought of as temporary. A feeding tube, on the other hand, while actually less invasive from a physiologic standpoint, is often thought of as life-support and is less accepted. Similarly, oxygen therapy is usually well accepted by most individuals, while a trach or vent is thought of as an extremely invasive form of life support. Feeding tubes or trachs are often perceived as something used only by people who are dying or severely disabled. Many people’s primary association with feeding tubes is the Terri Schiavo case, which portrayed feeding tubes as life support for individuals in vegetative states. Any intervention associated with elimination, whether it be intermittent cathing, a Foley, or an ostomy, is considered problematic by many individuals, often because of the association of incontinence with indignity. While these perceptions are almost entirely false and based on stereotypes, they definitely impact many people’s opinions. The literature about quality of life of children who use medical technology is somewhat spotty. There are not that many studies about children’s quality of life with these technologies in general, and those that do exist tend to target specific populations, such as children with severe disabilities or cancer. Nonetheless, there are enough studies to give us a general idea about quality of life with these devices. For example, there are several studies on quality of life in children with feeding tubes. Most show an improvement in quality of life for children and their families, or improvement in the health of the child. For example, a study of children with neurological impairment showed that tube feeding improved overall quality of life, and particularly health in the year following tube placement.¹ After a year, 84% of parents felt the tube improved their child’s quality of life, as well as their ability to care for their child. While other studies do detail some negative aspects of tube feeding, most of these involve the social acceptance of feeding. In other words, the children and families are often quite comfortable with tube feeding, while relatives and friends may not be. Some children do find social situations involving food to be difficult emotionally, and children who previously who were fed orally often have difficulty transitioning to exclusive tube feeding when necessary. In most cases, however, overall health, weight, and energy all improved, while pain often was decreased. A study on adults who received parenteral (IV) nutrition at home gives even more compelling evidence that medical technology can improve quality of life.² Adults in this qualitative study described increased energy, a feeling of well-being, and improved nutrition as a result of the IV nutrition, all of which allowed them to greater participate in daily activities. Several studies on individuals with neuromuscular diseases who were both trached and ventilated also demonstrate satisfaction with life and overall improvement in health.³ Over two-thirds were satisfied with their lives and 84% felt they made the right decision to use the technology. While health and energy improved, some individuals complained about self-esteem and disfigurement issues. While difficult to generalize, on the whole, studies show children and families accept medical technology well, and see an improvement in quality of life with the devices. While many adults view dependency on medical technology as worse than death, families who use these devices often see the exact opposite. In general, they see medical technology as improving their child’s quality of life, and providing health benefits. Many view these medical therapies as life-giving and life-saving. Children in particular view some types of medical technology as literally a part of them. 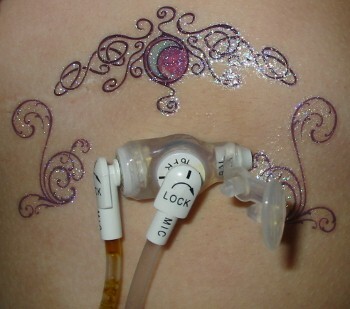 For example, many children name their feeding tubes, IV catheters, or ostomies. Some children who have been weaned off feeding tubes even describe removal of the medical device to be traumatic emotionally, as many children believe it is a part of their natural self. Children tend to be very resilient, and typically adjust well to having a piece of medical technology assist them. In a brief survey of parents on a parenting site for children with medical issues, most parents stated that their children’s medical devices improved quality of life overall. Some had difficulty with certain pieces of technology, such as children struggling with sensory issues related to wearing oxygen or CPAP. But most raved about the benefits of the devices, particularly tubes and lines. It is important to note that many families and their care teams think very carefully about their child’s quality of life before doing a medical intervention that would result in using a new medical technology. In other words, children whose quality of life would not improve with a certain medical technology typically do not receive that device. There is, therefore, a bias toward improved quality of life, since decisions are often based upon those considerations before the child even receives the device. If these devices have the power to improve the quality of so many lives, why is there such resistance toward them? I believe it is mostly due to a lack of awareness and the persistence of stereotypes among the general public. The solution to this problem is easy: education and awareness. Groups such as Feeding Tube Awareness and the Oley Foundation, along with activities including Feeding Tube Awareness Week and Parenteral Nutrition Awareness Week, help the general public to learn about these devices. They see that regular children with a variety of medical issues, ranging from very mild to severe, use and benefit from medical technology on a daily basis. Author: Susan Agrawal • Date: 10/17/2011 • Thanks to the moms at P2P for answering my questions about quality of life in their children. 2 Marion F. Winkler et al. An Exploration of Quality of Life and the Experience of Living with Home Parenteral Nutrition. JPEN 2010;34(4):395-407. 3 P. Narayanaswami et al. Long-term tracheostomy ventilation in neuromuscular diseases: patient acceptance and quality of life. Neurorehabil Neural Repair 2000;14(2):135-9. Nazish Khalid Hashmi et al. Quality of Life and Self-image in Patients Undergoing Tracheostomy. Laryngoscope 2010;120(S4):S196. Our New Grandbaby is Deaf, Now What?